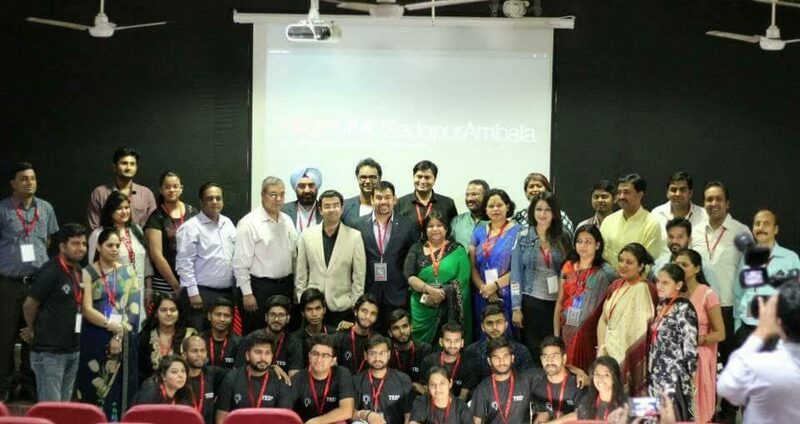 Maharishi Markandeshwar University, Sadopur organized its first annual TEDx event after the students of MMU Sadopur lead by Aniket Yadav got a license from TED to hold TEDx event here at the campus of the University. Krishan Gupta- A widely travelled man in more than 70 countries and the winner of the Best Emerging Start-Up company in 2016. Nareen Sodhi- A great achiever in the field of Digital film production. Krishan Chahal- Guinness world record holder in memory. Many esteemed organizations like Davidson Academy, Naveda (U.S.A) Indian Air force IIT Kanpur, DRDO, Indian Navy etc. have benefitted from his talent of exceptional memory skills. Bezwada Wilson- Human Rights activists, known for his campaigning against manual scavenging in India and winner of Ramon Magsaysay Award. He underscored the importance and strengthening of unity in diversity of India and not to take pride in the past glory of India but should work to bring back the glory of India. S. Ghai- Founder and CEO of the famous Santa Banta.com website. Vishal Sood- Innovative Strategic thinker. There was the diversity of speakers who inspired, informed and motivated the audience. The audience were served a sumptuous treat of variety of ideas which can change their attitudes, lives and ultimately the world. TED is a nonprofit organization and its aim is to only spread good ideas among the people of the world to foster betterment of the world. It is worth noting that TEDx conferences were organized in 32 Universities of China, Malaysia. Taiwan, Pakistan, Turki, Greece, Romania, France, Fizi, America, India, South Korea, Italy, Sweden, Mexico and Columbia.